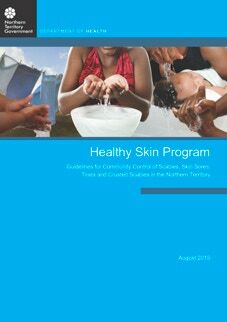 ﻿What ﻿is ﻿the ﻿Healthy ﻿Skin ﻿Program? ﻿It ﻿is ﻿a ﻿treatment ﻿plan ﻿for ﻿curing ﻿scabies. ﻿It ﻿was ﻿developed ﻿because ﻿there ﻿is ﻿a ﻿severe ﻿problem ﻿with ﻿scabies ﻿among ﻿the ﻿aborigines ﻿in ﻿Northern ﻿Australia. ﻿In ﻿some ﻿Aborinal ﻿communities ﻿50% ﻿of ﻿children ﻿and ﻿25% ﻿of ﻿adults ﻿have ﻿scabies. ﻿They ﻿needed ﻿a ﻿way ﻿to ﻿treat ﻿whole ﻿communities ﻿at ﻿once. ﻿They ﻿needed ﻿to ﻿have ﻿different ﻿plans ﻿for ﻿mild ﻿and ﻿severe ﻿cases. ﻿What’s ﻿different ﻿about ﻿the ﻿Healthy ﻿Skin ﻿Program? ﻿The ﻿unique ﻿thing ﻿about ﻿the ﻿Healthy ﻿Skin ﻿Program ﻿is ﻿that ﻿they ﻿sometimes ﻿use ﻿both ﻿a ﻿topical ﻿lotion ﻿("topical" ﻿means ﻿applied ﻿on ﻿your ﻿skin) ﻿and ﻿an ﻿oral ﻿medication ﻿at ﻿the ﻿same ﻿time. ﻿That ﻿means ﻿they ﻿attack ﻿the ﻿mites ﻿from ﻿outside ﻿in ﻿and ﻿inside ﻿out. ﻿It ﻿also ﻿means ﻿if ﻿the ﻿mites ﻿have ﻿some ﻿resistance ﻿to ﻿one ﻿of ﻿the ﻿medications, ﻿they ﻿probably ﻿won't ﻿have ﻿resistance ﻿to ﻿two ﻿of ﻿them.The ﻿two ﻿medications ﻿are ﻿usually ﻿5% ﻿permethrin ﻿lotion ﻿and ﻿oral ﻿ivermectin. ﻿They ﻿also ﻿have ﻿the ﻿option ﻿of ﻿using ﻿25% ﻿benzyl ﻿benzoate ﻿lotion ﻿instead ﻿of ﻿permethrin. ﻿That's ﻿great ﻿because ﻿some ﻿scabies ﻿mites ﻿have ﻿developed ﻿a ﻿resistance ﻿to ﻿permethrin. ﻿For ﻿children ﻿they ﻿suggest ﻿"5% ﻿sulphur ﻿cream ﻿daily ﻿for ﻿2-3 ﻿days ﻿or ﻿10% ﻿crotamiton ﻿cream ﻿(Eurax) ﻿daily ﻿for ﻿3-5 ﻿days ﻿for ﻿babies ﻿less ﻿than ﻿2 ﻿months. ﻿Wash ﻿off ﻿and ﻿reapply ﻿the ﻿cream ﻿once ﻿each ﻿day." ﻿So ﻿ultimately ﻿that ﻿means ﻿they ﻿include ﻿five ﻿different ﻿treatments ﻿in ﻿their ﻿program. ﻿That's ﻿great ﻿because ﻿about ﻿10% ﻿of ﻿scabies ﻿cases ﻿don't ﻿respond ﻿to ﻿a ﻿given ﻿treatment. ﻿I ﻿means ﻿if ﻿permethrin ﻿cream ﻿doesn't ﻿work ﻿you ﻿can ﻿try ﻿benzyl ﻿bezoate ﻿lotion ﻿or ﻿sulfur ﻿lotion ﻿or ﻿crotamiton ﻿lotion ﻿(Eurax ﻿lotion ﻿or ﻿cream). ﻿Plus ﻿they ﻿recognize ﻿the ﻿mites ﻿can ﻿cause ﻿a ﻿bacterial ﻿infection, ﻿so ﻿in ﻿that ﻿case ﻿an ﻿antibiotic ﻿is ﻿in ﻿order. ﻿When ﻿I ﻿was ﻿doing ﻿their ﻿program, ﻿I ﻿used ﻿5% ﻿permethrin ﻿cream ﻿once ﻿a ﻿week, ﻿but ﻿on ﻿the ﻿"off ﻿days" ﻿(when ﻿I ﻿wasn't ﻿using ﻿the ﻿permethrin ﻿and ﻿ivermectin) ﻿I ﻿used ﻿10% ﻿suflur ﻿lotion ﻿for ﻿three ﻿days ﻿and ﻿10% ﻿crotamiton ﻿another ﻿week ﻿for ﻿a ﻿few ﻿days. ﻿But ﻿I ﻿had ﻿a ﻿particularly ﻿severe ﻿case ﻿of ﻿scabies, ﻿so ﻿I ﻿was ﻿waging ﻿war. ﻿Anyway, ﻿the ﻿bottom ﻿line ﻿is ﻿the ﻿Healthy ﻿Skin ﻿Program ﻿can ﻿be ﻿tailored ﻿to ﻿any ﻿case ﻿of ﻿scabies, ﻿from ﻿mild ﻿to ﻿severe ﻿to ﻿stubborn. ﻿Click ﻿here ﻿to ﻿download ﻿their ﻿27 ﻿page ﻿booklet.